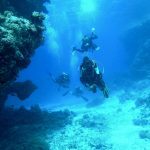 We can give you a personalised quote for your diving holiday. Please not we no longer arrange accommodation on behalf of our customers. With so many apartment and hotel booking engines feel free to find the accommodation that suits you and your budget best. We do still arrange group bookings, 10 or more, so contact us for a package deal. For more information or to book please contact us here.